On June 20, 1943, World War II came to the American heartland when a massive race related riot broke out in Detroit. An influx of 400,000+ people from the Southern US (many of which were African American) people to work in war related industries strained the housing market and competed for jobs and resources. The mostly White European population already living in Detroit chafed at the newcomers and the newcomers did not appreciate the cold reception. Before the riot was quelled by 6000 US Army troops, 34 people had died and well over 400 were injured. Over 1800 people were arrested. The sad fact is, that Detroit was not the only American city to suffer racial oriented riots during World War II, a time when American unity should have been at the forefront. You may think of the middle 1950’s through the 1960’s as the “Civil Rights Era” in the United States, but the facts are that African Americans and other minorities had struggled for many decades before that time, basically since North America was colonized by Europeans. In 1941 President Franklin Roosevelt had signed Executive Order 8802 to prevent racial discrimination in hiring in any war related industry. African Americans were often disappointed and irate that the Executive Order was often disregarded, especially in choice positions and supervisory jobs. In Detroit, a city with a legacy of Ku Klux Klan and Black Legion (also White Supremacists) activity the huge influx of Blacks was resisted by landlords and shopkeepers who did not want to serve African Americans. Tensions grew with the increasing population of African Americans and allegations of police brutality toward Blacks until things boiled over at the Belle Isle Park when fighting erupted between young Black and White men and boys. False rumors about various outrages against one race or the other fueled the anger, and every hostile act was met with an equal or greater hostile act. The rioting spread and young White men came from long distances to join in the fighting, many of which were unemployed. While White Detroiters attacked Blacks and destroyed Black owned property, angry Blacks attacked Whites and the police and burned or looted any White properties adjacent to African American areas. The demographic of the rioters was such that the average Black rioter was somewhat older than the average White rioter. Prior to the riot breaking out, the failure of war industries such as Packard Motors to integrate the work force in accordance with Federal mandates caused Blacks to walk off the job in protest. White workers did not object to Blacks working at the factories but objected to having to work directly alongside their Black co-workers. Meanwhile, other race riots broke out in Los Angeles, Mobile (Alabama) and Beaumont (Texas), news that fueled Black and White outrage. Other race riots occurred in the US during World War II, including in Harlem (New York) and in other less violent protests at factories and shipyards. Police were helpless to stop the fighting and destruction, and new false rumors kept appearing to ramp up emotions due to this or that alleged atrocity. Finally, the 6000 troops called in were able to restore order after 3 days of rioting and the loss of 34 lives. Not surprisingly, Whites and Blacks had a different view of what had happened and why it happened. Blacks blamed racism and unjust housing and work practices, as well as alleging unfair treatment of Blacks by the police. 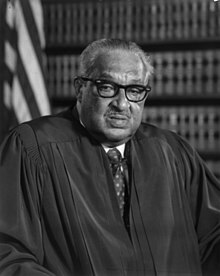 Whites, including the White politicians that ran Detroit and the industries blamed “Black hoodlums” and congratulated the police for performing “magnificently.” Future Supreme Court Justice Thurgood Marshall (the first Black US Supreme Court Justice) complained that 85% of those arrested were Blacks and that the police had stood by and did nothing while White rioters beat Blacks or destroyed Black property. Again, not a surprise, Japan and Germany publicized the riot as a sign of the decadence of the United States and the moral inferiority of our system of government and society. In more recent years the historical retrospective on the 1943 Detroit Race Riot has changed somewhat, blaming White antipathy toward Blacks more than Black outrage toward Whites. In the 1943 event Whites were often the aggressors and destroyers of property and the police and soldiers were not the targets of attacks. In later years, such as the 1967 Detroit Race Riot, the riot was fueled more by Black outrage and Black aggressive attacks against Whites and their property, including the police and National Guard. While it is sad and disheartening any time a riot breaks out because of racial tensions, the fact that this riot and other race riots could rage so violently during a war for our very survival is every so much more depressing. Do you have any anecdotes or comments about World War II race riots? Please feel free to share your information or opinions. William Johnson depicted the Harlem riot of 1943 in his c. 1943–1944 painting Moon Over Harlem. Capeci and Wilkerson. Layered Violence: The Detroit Rioters of 1943. Univ. Press of Mississippi, 1991. Shogan and Craig. The Detroit Race Riot: A Study in Violence – 1st Edition. Chilton Books, 1964.